Jessica McGowan/Getty ImagesGet ready to vote before Election Day on November 6, 2018! The 2018 midterm elections are here, and it’s not too late to make a plan to vote to make sure your Election Day goes off without a hitch. Election Day is Tuesday, November 6, 2018. Polls generally close around 7 p.m. or 8 p.m. local time, but the full list is below. 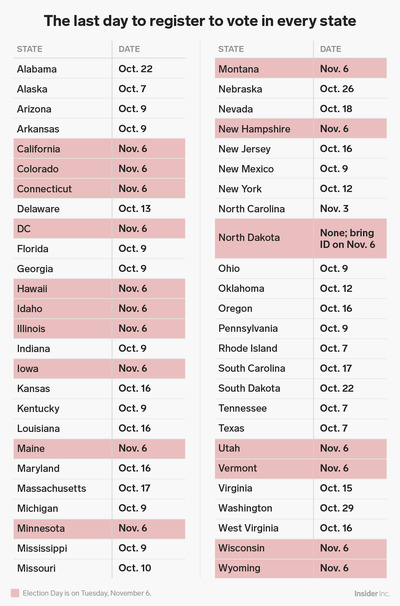 Here’s everything you need to know about your state’s voter registration deadlines, when your ballot is due if you’ll be voting absentee, whether you can take time off work to vote, whether you can take a ballot selfie, and when the polls open and close in your state. With the 2018 midterm elections upon us, now is the perfect time to start planning when and how you’ll vote, whether you plan to head to the polls in person on November 6 or send in an absentee ballot before then. A 2010 experimental study found that voter turnout was up to 9% higher among people who made a plan to vote before Election Day compared to those who did not. Since every state has different requirements and deadlines, informing yourself about voting in your state to make sure you won’t be blindsided by unexpected poll closing hours or registration deadlines will pay off when Election Day comes around. LIVE UPDATES: Follow our live coverage of the 2018 midterm elections here. 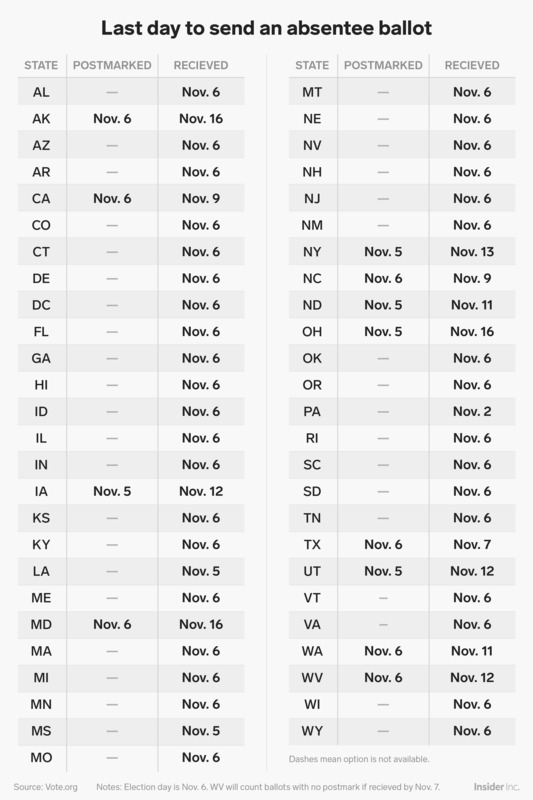 Here’s everything you need to know about your state’s voter registration deadlines, when your ballot is due if you’ll be voting absentee, and when the polls open and close in your state, if you plan to vote in person. 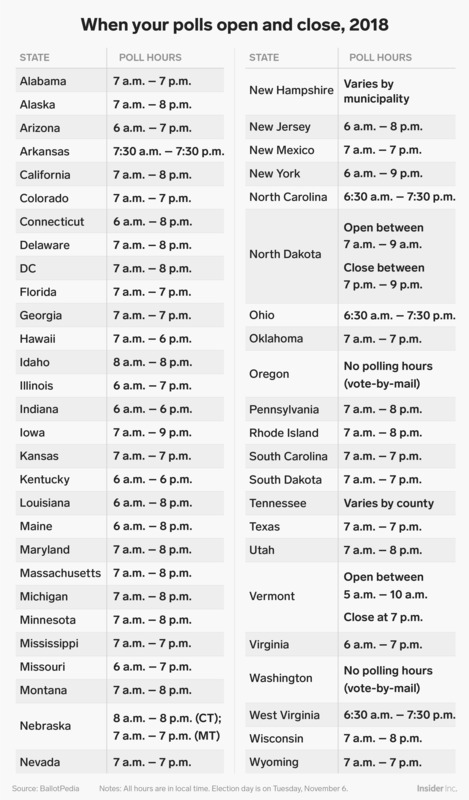 While most states close the polls somewhere between 6 p.m. and 9 p.m., almost every state has laws requiring that as long as you got in line while the polls were still open, you have to be allowed to cast a ballot if you’re in line when they close. If you’re in line when the polls close and are told to leave or have any problems voting, you can call the nonpartisan voter-protection hotline at 1-866-OUR-VOTE (1-866-687-8683) for assistance. If you’ll be working on Election Day and won’t be able to vote before or after work, you may be allowed to take time off work to vote. While voter registration deadlines have passed in most states, there’s still time to register if you live in North Carolina or one of the 16 states, plus the District of Columbia, that allows voters to register on Election Day. Since North Dakota has no voter registration, you don’t need to do anything advance besides bring an ID to the polls. (Keep reading below to more learn specifics about voter ID laws). 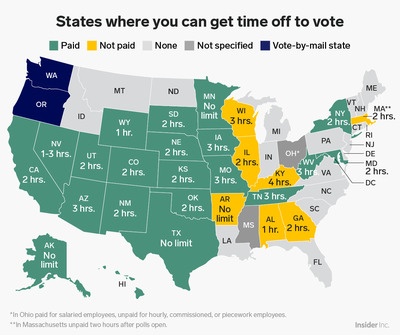 If your work schedule will make it difficult for you to vote on November 6, you may be able to take time off from work to vote depending on where you live. Thirty states currently have laws requiring employers to give employees either paid or unpaid time off from work to vote on Election Day. But many states have additional restrictions giving employers discretion over what hours workers can leave to vote and/or requiring employees to obtain prior permission, so be sure to check your state’s requirements and discuss taking time off with your boss well in advance of Election Day. 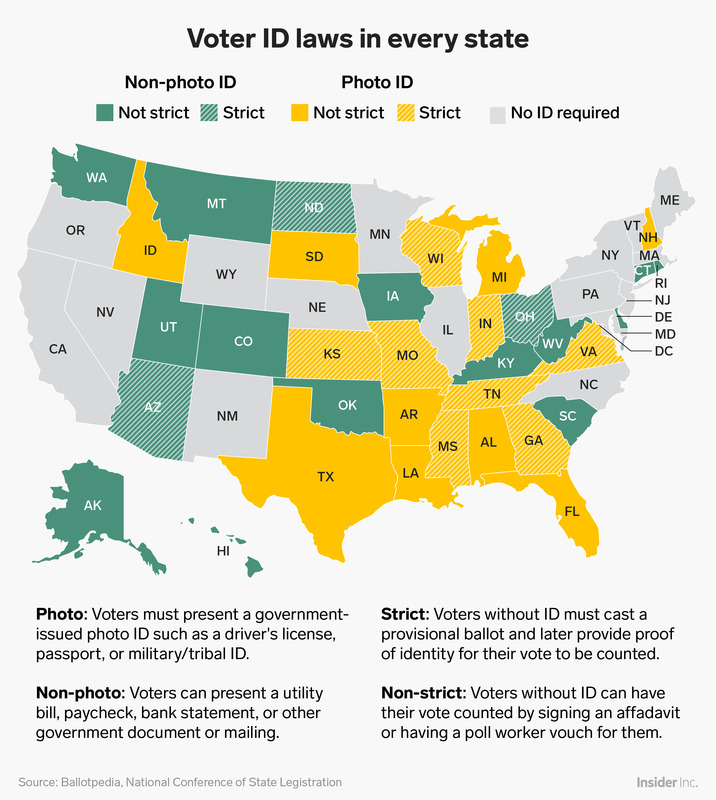 The number of states requiring voters to bring some form of ID to the polls has more than doubled since 2001, and the requirements greatly vary across different states. Bringing a piece of mail or government document with your name and address is sufficient in many states, but in others, you’ll need to bring a non-expired photo ID approved by your state’s government. In Texas, for example, a concealed-carry permit is an admissible form of ID to vote, but a state university-issued student ID card is not, so be sure to read up on the accepted documents in your state before voting. While some states will allow you to sign a sworn affidavit to have your vote counted if you don’t have an ID, others only let you cast a provisional ballot, and will only count your vote if you provide election officials with an admissible ID within a certain amount of time. In the internet age, it’s become increasingly popular among voters to take pictures of their ballots to post to social media as proof to their friends that they completed their civic duty of voting. But in some states, taking and posting such a “ballot selfie” might land you in trouble with the law. State laws against showing your ballot to another person are meant to preserve the secret ballot, and protect against people being coerced or bribed to vote a certain way. While some state legislatures or secretaries of state have adapted their policies to the digital age, some states still ban ballot selfies, and in some, the law is murky. 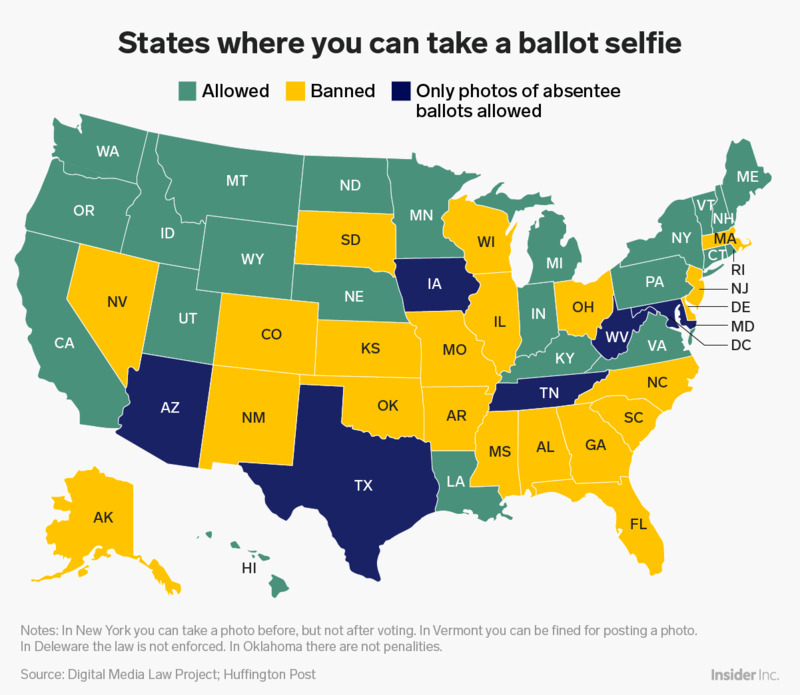 Since policies around ballot selfies may vary among different cities in a given state or be inconsistently enforced, it’s a good idea to check with a poll worker before whipping out your phone to snap a picture of your ballot. 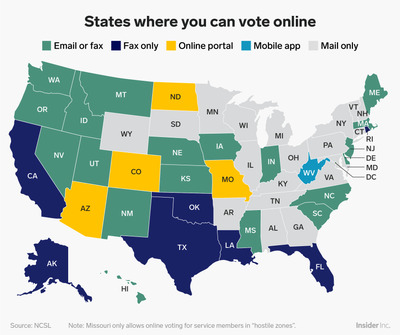 Currently, 25 states allow voters, most of whom are military service members protected under the Uniformed and Overseas Citizens Absentee Voting Act (OUCAVA) to send in their absentee ballots electronically via email or a state-run online portal. West Virginia is currently testing out a blockchain-based mobile app through which service members can submit their ballots after authenticating their identity with a fingerprint or facial recognition. While electronic voting can be much easier and more reliable than mail for military service members in remote areas without consistent access to postal services, it also comes with cybersecurity risks. 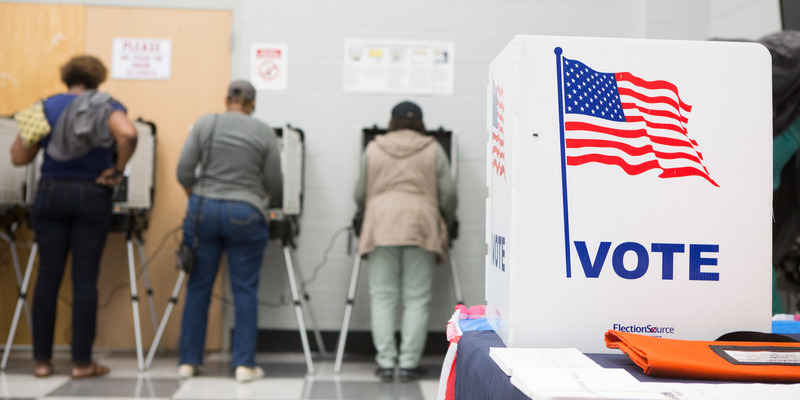 Experts warned in an October 2018 report that voting online opens up voters, election officials, and their devices to systemic malware attacks, privacy breaches, and “denial of service” attacks that can disable an entire town’s election systems. While most states require that your absentee ballot be postmarked or received by your election official by Election Day, some will count your ballot as long as it arrives within up to 10 days of Election Day. If you request a ballot but don’t receive it in time to mail in back by your state’s deadline, you can fill out the Federal Absentee Write-in Ballot as a backup. In the meantime, you can use Ballotpedia’s sample ballot lookup tool for information on all the federal, state, and local elections and/or ballot initiatives that you can vote on this fall.